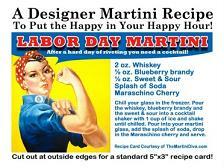 Here's the Labor Day Martini for everyone who has to work for a living. It's a strong drink because that's what you need at the end of a long work day, it's also a little sweet to put the smile back on your face after the woes of work. The cherry is your bonus. 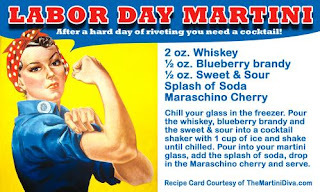 Labor Day is a United States holiday that is observed on the first Monday in September. The first Labor Day in the United States was observed on September 5, 1882, by the Central Labor Union of New York. They held the very first Labor Day Parade. It became a federal holiday in 1894, instituted by President Grover Cleveland to appease the labor movement after a number of striking workers were killed in the Pullman Strike by the U.S. military and U.S. Marshals. The two men most often sited as the creators of Labor Day are Peter J. McGuire, a co-founder of the American Federation of Labor, and Matthew Maguire, a machinist and secretary of the Central Labor Union in New York. Get it on a Fun, MAILABLE POSTCARD to use as a party invite or share with friends here.